Dental Implant and Crowns HAPPY PATIENT REVIEW at Cancun Cosmetic Dentistry! 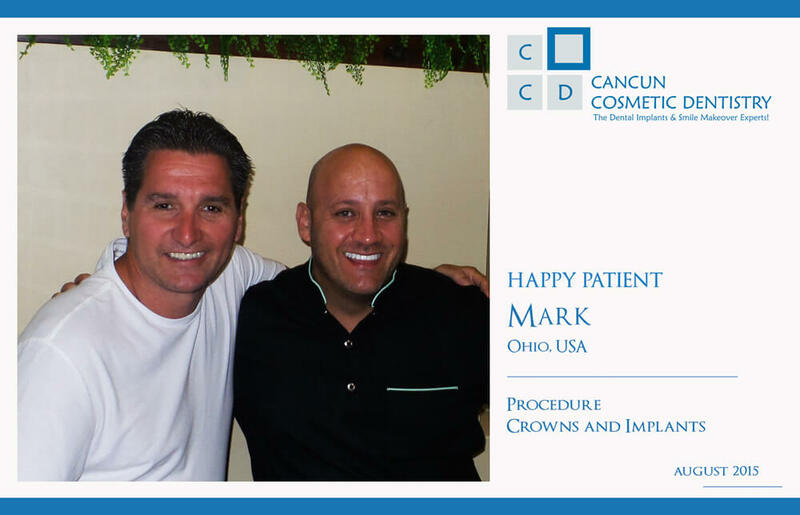 We would like to thank our dear patient Mark from Ohio for his visit last month to our clinic. He has traveled to Mexico many times because he loves the sights and the people here and he decided to come here for his dental treatment. He found our page and after looking at the information it didn’t took him long to plan his vacations around his appointment. He got crowns and dental implants to improve his dental health and also to sport a beautiful smile. When he got here Mark thought our dental facility was very good and clean; in fact we have been regarded by the past president of the AAID, Dr. John Minichetti, as having top notch facilities that could even rival some of the most modern dental practices in USA. Mark was also gladly surprised by our excellent costumer attention. Our staff was with him on every step of the way, explaining his treatment and making him feel at home. During his stay in Cancun he also visited Chichen Itza and explored some of the local cenotes. Cenotes are natural sink holes with groundwater underneath. Cenotes were thought to be the gateways to the underworld on Mayan culture and sometimes they even were the sole source of freshwater in the area, as there are no significant rivers in the Yucatan Peninsula. Now, they are a wonderful tourist attraction, and hundreds of people come to swim on their cold clear waters. Everyone was so kind and caring. Your professionalism shows in all the attention you gave to me and my wife. Happy Patient in Cancun Cosmetic Dentistry: "The best I have had"
Designing the smile of your dreams! Ready for you dental vacation in Cancun? Facts and travel tips here! 5 shocking microscopic photos that will make you brush your teeth! All on 4 Happy Patient at Cancun Cosmetic Dentistry!